The Lotus Pent Shed adds style and practicality to any household, while keeping your belongings organised and protected from the elements. Lotus metal garden buildings have been specially developed for excellent strength and durability with a modern and stylish design. The Lotus Pent Shed has been constructed from high tensile, hot-dipped galvanised steel with superior bracing throughout to ensure long-lasting resilience. The attractive pent roof design and the beautiful Anthracite Grey colour scheme of the Lotus Pent Shed will complement all gardens. The shed’s sliding double doors allow ease of access to the contents, as well as reducing the need for manoeuvring large or bulky objects. For enhanced security, the doors can be locked with a padlock. Ventilated gables ensure adequate airflow throughout and the high grade, 0.3mm steel is resistant to rust. The shed is virtually maintenance-free, with no treatment required. The frame and base rails are constructed from solid, heavy gauge, galvanised steel for a highly durable shed, providing strength and simplicity. The components have been created with straight-forward assembly in mind, and the informative and user-friendly instruction manual helps the process to be hassle-free. All required fixings are provided. Lotus garden sheds are ideal for all homes, as well as situations that require non-combustible storage buildings, such as for caravan parks. 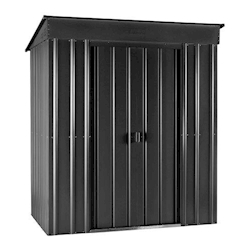 The Lotus Pent Shed is strong and sturdy, offering protection from weather conditions with a spacious interior that is perfect for all your storage needs. 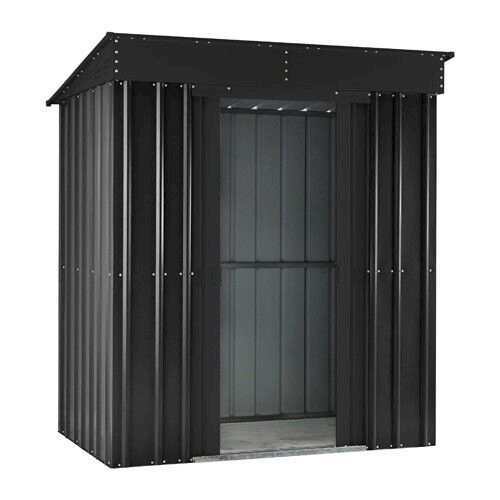 All of Lotus’ metal sheds are protected by a 15 year warranty period for your peace of mind. The Metal Foundation Kit is used to create a firm and level base for your Lotus shed. 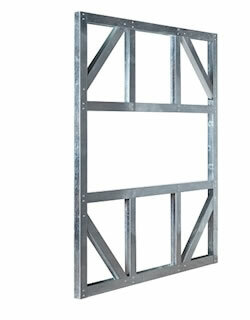 The kit is a self-assembled framework consisting of metal battens. Once assembled, fill the framework with concrete or add a wooden floor to create your base. A damp proof membrane should be used in conjunction with the framework, placed underneath the base to reduce condensation. This Metal Foundation Kit provides an alternative to the Lotus Timber Floor Kit. If you have an existing concrete or paving slab base with a damp proof membrane, you will not require an additional base. The Timber Floor Kit contains pre-cut, pressure treated boards and battens. 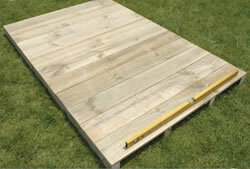 This is used to create a firm and level base for your shed, and supplied with the necessary fixings. A damp proof membrane should be used in conjunction with the timber floor, placed underneath the base to reduce condensation. This Timber Floor Kit provides an alternative to the Lotus Metal Foundation Kit. If you have an existing concrete or paving slab base with a damp proof membrane, you will not require an additional base. 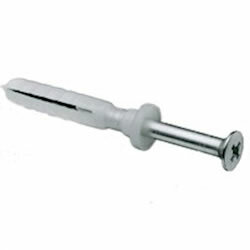 The Anchor Hilti Kit contains 14 Hilti screws to firmly anchor your shed into concrete or flagstone bases.